I love putting personal touches on our walls, especially in Pinky’s room. When we decided to move her to her new room I had a good idea on the bedding that I was going to get her. Then, I came across an adorable wall decal from RoomMates Peel and Stick Decor and knew it would be the perfect accent for her new room. RoomMates has hundreds of decals for every room in your home including tons of options for children’s rooms decals even some of their favorite familiar characters. 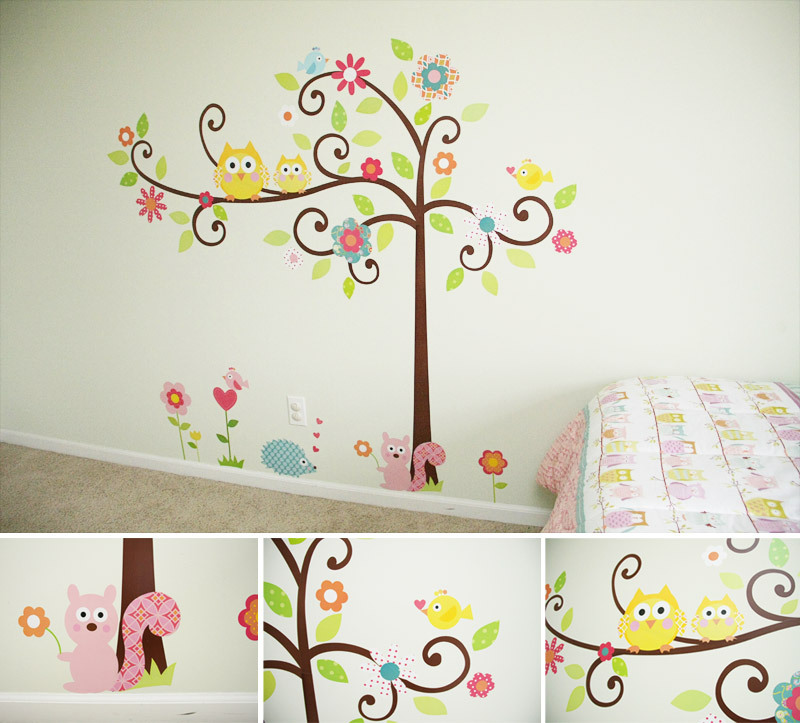 The Scroll Tree MegaPack is nearly a perfect match for her bedding set and would easily and affordably give her an adorable mural in her room. The decal came in 2 large sheets that were nicely rolled into a package to prevent it from bending and creasing. It comes with 80 individual decals that you can either get creative with on your own or follow the easy numbered instructions included. Viola! Her wall is so adorable and she loves it! We have fun pointing out what each of the animals are. Her favorite is the Squirrel (or as she calls it, Sqoool). It’s also affordable, this huge decal is only $41.19! So, it’s easy and way more affordable than having someone paint a mural. I’m so happy with the results and it’s added such a perfect accent to her room instead of the boring plain walls it had before. Connect with RoomMates for all the latest news and promotions! RoomMates Peel and Stick Decor is available at www.roommatesdecor.com and orders over $49 get free shipping! Two Mommy Digger readers will win a $25 Gift Certificate for the RoomMates Peel and Stick Decor of their choice! To enter, fill out the Rafflecopter form below. Ends 9/10 at 11:59PM EST. I like the Quotables selection. God Bless This Home is my favorite. I would get the paisley dry erase decals. New Super Mario Bros. Wii: Wall Decals.